"This act of generosity and wisdom from a very good writer will help anyone who is staring at a blank page, any day, any time. Highly recommended." 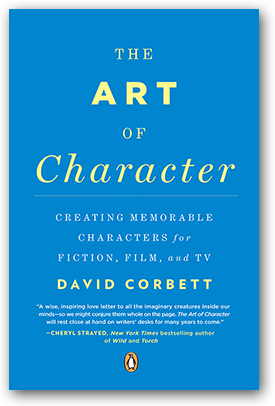 "David Corbett's The Art of Character offers a deep inquiry into the creation of character for the novice writer, with valuable nuggets of wisdom for the seasoned storyteller. If you are a writer, it should be on your desk." "David Corbett's The Art of Character belongs on every writer's shelf beside Elizabeth George's Write Away and Stephen King's On Writing. An invaluable resource for both the novice and the experienced hand, it's as much fun to read as a great novel." "The topic of character development begins and ends with David Corbett's The Art of Character. This is the book on the subject, destined to stand among the writings of John Gardner, Joseph Campbell, and the others of that select few whose work is fundamental to understanding the craft of storytelling." "David Corbett has combined his unique talents as a gifted writer and an extraordinary teacher to create a superb resource on character development. Deftly crafted and impeccably researched, The Art of Character is a thoughtful and insightful book that is immensely readable and practical. Suitable for beginners to best-selling authors, The Art of Character should be on every serious writer's shelf next to Strunk and White's The Elements of Style, Anne Lamott's Bird by Bird, and Stephen King's On Writing. Highly recommended." "It is rare to find the deep philosophical questions of literature (and life) met with such straight-forward and inspiring instruction. But David Corbett is that writer, and The Art of Character is that book." —Robert Mailer Anderson, author "Boonville"
"David Corbett is a guy who knows his business. Reading this book, I learned things I didn't know and was reminded of ones I did. I recommend The Art of Character to every writer, at any level." "Character is the beating heart of fiction and with The Art of Character novelist David Corbett has written a clear, in-depth, and highly entertaining exploration of how to create remarkable characters. This an essential guide to students of the writer's craft at all levels." "Writers--pay attention! The Art of Character is a tremendously useful and important book. David Corbett delivers in-depth analysis and practical wisdom on every page." "Both inspiring and practical, The Art of Character belongs on every writer's shelf. David Corbett brilliantly illustrates those elusive tools writers need to breathe life into their characters with greater confidence and deeper insight."